Roman Catholic Bishop Daniel Jenky of Peoria, Illinois sent a letter to his flock telling them that supporting politicians who support abortion reject Jesus. He also spoke against the HSS mandates that would compel the Catholic Church to adopt policies contrary to their moral teachings. Today, Catholic politicians, bureaucrats, and their electoral supporters who callously enable the destruction of innocent human life in the womb also thereby reject Jesus as their Lord,” Jenky added. “They are objectively guilty of grave sin. Can any serious Christian (one who holds to the moral tradition) argue with his words? I don’t think so. I’m sure we will hear a chorus of complaints, some from within the Catholic Church about his statement (it is radical after all) but most of objectors won’t have a clue about moral theology, especially how the safeguards against human barbarity, particularly those that begin with the logic the some people are more valuable than others, must reference something higher than man himself. Relative value of human beings certainly is the ideological pedigree of the abortion movement and the industry that is spawned given its origins in the eugenics movement in the early part of the last century. It has no room for God. If it did, the moral and intellectual bankruptcy of the thinking could not be hid. If, say, an Orthodox bishop said the same thing, would we probably object. We Orthodox fancy see ourselves as less rigid in some ways (and we are), but sometimes that fluidity just hides a breakdown of serious thought (see: A patriarch who ‘generally speaking, respects human life’ for example) or moral cowardice, both of which end up affirming the ideologies that war against human value and exceptionalism. The objection then, if we have one, probably has more to do with out discomfort that Bp. Jenky is direct and uncompromising rather than anything substantive. So as I consider Bp. Jenky’s words, I conclude he is right. What do you think? CHICAGO — Joining the chorus of Roman Catholic clergy in Illinois criticizing President Barack Obama before next week’s election, Peoria Bishop Daniel Jenky ordered priests to read a letter to parishioners on Sunday before the presidential election, explaining that politicians who support abortion rights also reject Jesus. “By virtue of your vow of obedience to me as your Bishop, I require that this letter be personally read by each celebrating priest at each Weekend Mass,” Jenky wrote in a letter circulated to clergy in the Catholic Diocese of Peoria. In the letter, Jenky cautions parishioners that Obama and a majority of U.S. senators will not reconsider the mandate that would require employers, including religious groups, to provide free birth control coverage in their health care plans. “This assault upon our religious freedom is simply without precedent in the American political and legal system,” Jenky wrote. Read the entire article on the McClatchy website. I have no quarrel with Jenky, other than to say that 1) his statement, “This assault upon our religious freedom is simply without precedent in the American political and legal system,” is, in fact, wrong; and 2) if his statement, “a vote for a candidate who promotes actions or behaviors that are intrinsically evil and gravely sinful makes you morally complicit and places the eternal salvation of your own soul in serious jeopardy,” he signals the end of the electoral system as we know it. I don’t exactly know what to make of the fact that I actually shared the Chalice with a prominent Orthodox Christian member of congress… but who am I to judge the funding of a war justified by falsification as “intrinsically evil and gravely sinful?” As near as I can tell, I feel no “discomfort that Bp. Jenky is direct and uncompromising,” and these issues strike me as considerably substantive. Generalizations killed the cat – or something to that effect. How is it wrong and does funding a hospital fit into the argument? You need to unpack that. M. Stankovich, speaking as a Catholic, I think part of the reason for your concern is the unfamiliarity of some of the terms, such as intrinsic evil and moral complicity. (3) Intrinsic evil is always wrong in all circumstances. Extrinsic evils are to be avoided but are not wrong in and of themselves. Murder and Abortion is an example of an intrinsic evil. War and poverty are examples of extrinsic evils. (4) Ones degree of culpability depends on various factors such as ignorance and how close you are to the evil. So someone robbing a bank is more moral complicit than someone driving the bank robber to the crime (with full knowledge what will happen) and that is more moral complicit than someone who knows that the bank robber will commit the bank and does nothing to stop or discourage him. (5) Voting for a politician that enabled an intrinsic evil makes you moral complicit. (7) When forced to choose between intrinsic and extrinsic evil a Catholic must always choose the extrinsic evil. (8) It is never allowable to to instrinic evil so that good can come out of it. I know Orthodox theology comes at this from a different perspective, so different concepts are used, but from my readings, each one of the above mutually reinforcing principles are well within Orthodox theology. Mr. Stankovich, I actually agree with you that the attack on our religious liberties that is part of Obamacare is without precedent. It is the culmination of a decades long attacks on religious freedom and the Constitutional prohibition that “Congress shall make no law restricting the free exercise of religion.” Unfortunately, the Roman Catholic Church has been complicite in a good deal of this under the guise of ‘social justice’. It is part of the whole eqalitarian nonesense that led a college in Washington St to allow a man, with normal male genitalia, who claimed to be transgendered to wander around in a girl’s/woman’s locker room fully naked and exposed to girls as young as six. I trust you do not deny that there is an attack on religious freedom in this country. Michael, I agree with you heartily, but I would also caution that the complicity of American Catholics in the cultural movements that eventually produced Obamacare and the HHS mandate was not brought about through the Catholic Church as a whole. It arose through Catholic malcontents (some at high levels) who tried to use Vatican II as an excuse to recast Catholic doctrine and practice in Marxist terms. Some of these were more obvious (liberation theology comes immediately to mind) and some less (“social justice,” liturgical degradation in the name of making worship more accessible, and so on). But the popes and many other traditional Catholics never gave up the fight. Paul VI’s “Humanae Vitae” and Blessed John Paul II’s Theology of the Body, for example, redefined the Church’s debates over human dignity and sexuality. Under JPII’s and now Benedict XVI’s leadership, the clouds of error kicked up by the Marxists are blowing away, the fidelity of Vatican II to Catholic tradition is emerging from decades of obscurity, and even American Catholics are recovering their moral voice. My objection was first with the “no-lose,” media-savvy grandstanding that Bishop Jenky employed, waiting until immediately prior to the election for maximum exposure. Fr. Ioannes would suggest this is “morally confrontational,” even courageous, while my thought is that the Bishop is quite confident that his tax-exempt status is hardly compromised. On the other hand, I suspect a similar act of “moral defiance” by Fr. Ioannes, with a family to feed, might not earn him a “reckoning,” per se, but a touch more “scrutiny” from the IRS is not beyond the pale. As to your second point, I was simply suggesting that, while I certainly grasp the import of concepts as expressed by the Bishop(s), I am reminded of Psalm 129:3, “If You, O Lord, should make an accounting of iniquities, O Lord, who shall stand?” We have endured sinful, even repellent characters as Popes & Patriarchs, priests & deacons, emperors & presidents, and yet we blunder through it. At least in the East, the notion of “personal sanctity” for rulers, and even clergy for that matter, has never been thought to “impede” God’s ultimate plan for salvation. In effect, when they rule in righteousness, we stand with them, and when they deviate, they stand alone. You have no argument from me. The Church is besieged on every side, yet remains a “calm port in a sea of storm, a haven of salvation for the lost.” One only need sit through the dramatic confrontation of the full cycle of Holy Week to appreciate that “the time comes, that whoever kills you will think that he does God service.” (Jn. 16:2), figuratively & literally. Fr. Ioannes has stated that the bishops lack moral authority – which in my opinion is a statement much more courageous than Bishop Jenky – so I am confounded as to why such an effort is invested in “merchandizing” one political party, one social “solution,” or one candidate over any other. As Fr. Florovsky pointed out, even the Byzantine “ideal” was a miserable failure, and it is the Church that would transform the world, and not vice versa. Bp. Jenky is speaking to his flock, not the world at large. Even if he were, the idea that clergy should refrain on speaking on matters political should not be under the purview of government anyway. I have little use for Pastor Jeremiah Wright but I’d rather have a healthy debate over his wrong headed ideas then threaten him with closure through IRS sanctions. That’s one why reason why the language for freedom of the press and freedom of religion in the Bill of Rights are virtually identical. As for challenging the rulers of this world, we have St. John Chrysostom as an example, among others. Bp. Jenky’s statements are not “merchandising” one party over another but pointing out the real threat of increasing government encroachment into church affairs. He is quite correct in vigorously denouncing it because if not stopped the Catholic Church simply becomes a ward of the state in the end — an intention that I believe shapes the Obama administrations intransigence towards them. If the Republican’s tried the HHS maneuver in the way that the Democrats have, they should be denounced for it as well. Released October 18, 2012 to be read in Catholic Parishes on November 4 and 5, 2012. Since the foundation of the American Republic and the adoption of the Bill of Rights, I do not think there has ever been a time more threatening to our religious liberty than the present. Neither the president of the United States nor the current majority of the Federal Senate have been willing to even consider the Catholic community’s grave objections to those HHS mandates that would require all Catholic institutions, exempting only our church buildings, to fund abortion, sterilization, and artificial contraception. This assault upon our religious freedom is simply without precedent in the American political and legal system. Contrary to the guarantees embedded in the First Amendment, the HHS mandates attempt to now narrowly define and thereby drastically limit our traditional religious works. They grossly and intentionally intrude upon the deeply held moral convictions that have always guided our Catholic schools, hospitals, and other apostolic ministries. Nearly two thousand years ago, after our Savior had been bound, beaten, scourged, mocked, and crowned with thorns, a pagan Roman Procurator displayed Jesus to a hostile crowd by sarcastically declaring: “Behold your King.” The mob roared back: “We have no king but Caesar.” Today, Catholic politicians, bureaucrats, and their electoral supporters who callously enable the destruction of innocent human life in the womb also thereby reject Jesus as their Lord. They are objectively guilty of grave sin. For those who hope for salvation, no political loyalty can ever take precedence over loyalty to the Lord Jesus Christ and to his Gospel of Life. God is not mocked, and as the Bible clearly teaches, after this passing instant of life on earth, God’s great mercy in time will give way to God’s perfect judgment in eternity. I therefore call upon every practicing Catholic in this Diocese to vote. Be faithful to Christ and to your Catholic Faith. May God guide and protect His Holy Church, and may God bless America. Perhaps you thought I did not read the letter in its entirety, Abouna? The link was sufficient. You seem to be assuming that I am at odds with the content of the Bishop’s reasoning. I am not per se. But as a Christian, am I expected to “vet” the grocer, the bookstore owner, the dry cleaner, my personal physician, my dentist, my auto repair person, (holy cow!) the taxi driver, and so on as to their “moral complicity with intrinsic evil?” It is you, after all, Abouna, who drew the analogy with our “breakdown of serious thought,” or “moral cowardice.” Thus my thought that we are not so much “about” making distinctions between intrinsic and extrinsic evil. However, As Mr. Wang notes, “When forced to choose between intrinsic and extrinsic evil a Catholic must always choose the extrinsic evil,” and in the East, what can we say but, we are sinners who vote for sinful people, discerning as best we can. If I continue with the criteria offered by Mr. Wang, Rep. Darryl Issa, an Orthodox Christian of the Antiochian Archdiocese (cough), has stridently defended his vote to fund the war in Iraq; my schoolmate and friend, Bishop Avak, Armenian Orthodox Bishop of Baghdad (can you imagine, he tended the vending machines at SVS!) called it a “massacre of the innocents,” and in the end, the justification for this war – weapons of mass destruction that were a threat to the region & the world – was a fabrication. Is any unjust war that results in the unjust death of innocents less abhorrent – less intrinsically evil – than abortion? Who will instruct me as to the “correct” interpretation as it ultimately relates to my salvation? Apparently, Bishop Jenky believes he is the one to do it. Well & good, obviously it is his prerogative. But to suggest a “consequence-free” imposition of his statement as akin to Nathan the Prophet confronting David the King is a very long stretch. Now, by rights, Mr. Bauman, should nail my backend to the wall, because I have expressly stated that I do not comprehend sociopolitical matters, and should not comment on such matters. A crash course in the Orthodox moral tradition pertaining to issues of war and peace (specifically, the three books on the subject published by yours truly and available via amazon.com — http://www.amazon.com/Alexander-F.-C.-Webster/e/B001K7R4RE/ref=sr_tc_2_0?qid=1352125619&sr=1-2-ent) might help to form your conscience. While I sincerely appreciate your offer, the point was not regarding my conscience. Prof. SS Verhovskoy was particularly formative when I received a letter of “inquiry” at SVS from my Draft Board after I found myself very near the top in the final draft of the Viet Nam era. I was eighteen years old and could not have imagined that anyone would enroll in an Orthodox seminary – my dream – simply to avoid military service. Hmm. After several extended discussions, Professor concluded by having me type that I was a seminary student, but as a Christian, I was “obligated to serve if required.” In approximately two weeks, I received a new draft card, without comment, where I was re-classified as deferred as a divinity student. Secondly, I was an intern in a large military hospitality for more than a year, knowing nothing of the culture or the sacrifice. This has led to me making my share of apologies to priests and their families for assuming the military was simply a “guaranteed” income & retirement. If you world consider my moral dilemmas, I would value your comments regarding this. My point was about “vetting” & discernment, and it is is now extended in that you offer a “crash course,” which I presume is in an area you are qualified to offer, but I have not formally “vetted” you, and I do not know you. But it is entirely possible for you to begin with an “appointment” based on reputation, military service, and scholarship; establish a canonized voting record; and even attain a state or national office without too much scrutiny as to your support of issues of “intrinsic and extrinsic evil.” And along the way, people will vote for or against you relying on a minimal amount of “data” you have carefully provided. We are sinful people who elect other sinful people as best we are able. And we practice what we preach as best we are able, most often at the parish level, at the hand of long-suffering, underpaid, and disrespected priests. I, for one, am exhausted with this verse, “God is not mocked,” (Gal 6:7) because God is continually mocked (and the word is μυκτηρίζεται “turn up the nose” – which is derived from μυκτηρ “nostril” – “like a pig”) when we say “ultimately, God is the Judge.” So, let Him Judge! And ultimately, He will. But this is insufficient for Bishop Janky, who seemingly cannot appreciate that a government cannot provide what Bishops were intended to provide: moral leadership. Mr. Stankovich. no need for me to nail any part of you to the wall, you do it yourself quite well. Having read two of the three books Fr. Alexander mentions plus having spent two intense years with my son as he reflected on the Orthodox moral tradtion regarding war and military service, I can say there is quite a bit of difference between abortion and war. Sunday’s homily at my parish quite clearly condemned the support of abortion, homosexual unions glorified as marriage, murder and ‘unecessary war’. Note the adj. in front of war where none exists in front of the other actions. Murder, homosexuality, and abortion are abhorent in the Orthodox moral tradition. My priest likened support of any of these activities to the denial of Christ Himself. War was not included in that category, even unecessary war. The trouble is that it is notoriously difficult to determine what war is necessary and what war is not. As Fr. Alexander points out in his book “The Pacifist Option” there is what he calls the zero sum dilemma. That is our inaction in times of war, while it might keep us morally pure, allows others to come to harm, just as our action in times of war can cause others to come to harm. My son came to the conclusion that what sets the Chrisitan apart, or should, is the act of peacemaking no matter what circumstances one finds oneself in. At imes, such peacemaking unfortunately entails the use of physcial, even deadly force. (Objections noted and understood). For every war that someone thinks is necessary there are very good existential and historical reaons why it need not have been fought. Even in wars deemed necessary, immoral and amoral actions will be taken. No war ends without harm to all sides even the ‘winners’. War, like poverty, we will have with us always. They are existential dilemmas with which we must struggle and there can be a wide divergence of thought and action by faithful Orthodox. Not so with the evil that Obama promotes in abortion and the destruction of both natural and scaramental marriage that he wishes and his policies promote. Such evil will only multiply if he is given 4 more years. He rules without regard to the Constitution, natural law or divine law. We have never seen another President approach his degree of lawlessness. I hope we never will. BTW: His grace Bp. Basil has not been home for some time as he is tending his flocks. When he is back home, I intended to seek him out for more complete instruction on the Scriptural and patristic understanding of homosexuality in both a soteriological framework and a pastoral one. I’ll let you know what I learn. Frankly, I am surprised that many more American bishops — Catholic, Orthodox, and Protestant — have not ordered their priests to read a letter in their sermons this Sunday asking parishioners not to vote for politicians who support abortion, especially since President Obama believes it is all right for the federal government to favor abortions, gay marriages, and birth control mandates. 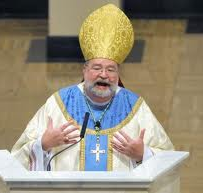 Graham’s words clearly justify Bishop Daniel Jenky’s right to order his priests to read his letter in their sermons that denounces politicians who support abortion and other anti-Christian doctrine. Of course I agree (no surprise!). Bp. Jenky follows the Catholic Church’s distinction between political matters over which legitimate differences of opinion may occur (economic policy, jurisprudence, etc.) and moral matters over which there can be no dispute (abortion, embryonic stem cell research, contraception, homosexual marriage, etc.). Bp. Jenky points out to his flock that abortion is an irreducible evil, that to vote for any candidate who would advance this evil is to participate in it, and that such participation directly affects our eternal salvation. The letter does not support one candidate over another (neither Obama nor any other candidate is named). In it, rather, the bishop fulfills his pastoral duty to his flock by clearly instructing them on an essential aspect of their participation in the Body of Christ. He speaks, not out of his own conviction, but with the full authority of the Church’s moral tradition. On this subject, he has the full right and responsibility to speak as he does, as he would not if he based his admonitions, for example, on his personal views of individual politicians. Of course, the McClatchy editor tries to relocate the bishop’s letter from the moral realm into the political realm with the headline!